The nice people over at Wanted sent me an email a couple weeks ago asking if I'd be into them sending me a pair of shoes. I wasn't sure I would find something that I liked but as soon as I laid eyes on these desert boots, I was smitten. WHAT A RIDICULOUS SHOE!, I thought. But god knows I love a ridiculous shoe and since I still couldn't get them out of my mind a couple days later, I decided to go ahead and take the plunge. These boots are meant to be my everyday scrounging around shoes, because as much as I want to think that my Wang manshoes are a "comfortable everyday" shoe, the truth is that they are not and my feet would probz really appreciate it if I stopped treating them as such. Generally, I like my everyday whatever shoes to be the opposite of something that seemingly "goes with everything" and I'm only getting a new pair because my little scrunched down boots, that I have in silver AND gold, no longer have soles and it's getting too cold out for me to walk around with sock on cement (I know, I know, I could throw them away but true shoe love is forever!). 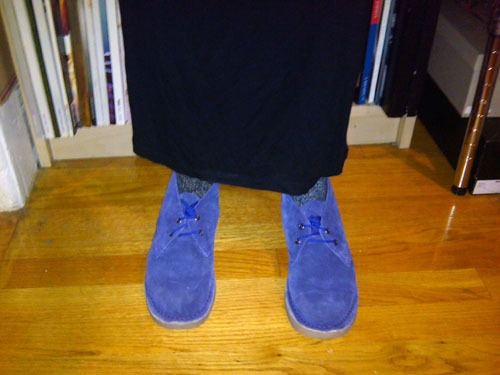 Well, that was QUITE a tangent, but bottomline is the shoes are pretty comfortable. I will buy them new regular purple shoelaces since these round super bright acrylic things are a little waah. The leather around the soles is not evenly sewn on both pairs but I'm gonna go with what my boyfriend said about it being a "rustic" thing even though I'm certain that it's not. Overall though? I'm super stoked on these. They'll bring a cool awkward vibe to my everyday wear. I think your fashion sense is really great! I likethe shade of blue on your shoes, it's unusual. Then the runway shots below, wow. Thanks for sharing the photos and drop by me too when you have time. so awesome! i am such a sucker for any garment/accessory that is purple.